We spent the day exploring the French Quarter. Sharon and I met Janie and the Gainsleys and headed to Cafe Du Monte for beignets and coffee. Afterwards, we walked along the Mississippi River towards the French Market. We wandered back down Decatur Street into Jackson Square. Sharon and I toured the St. Louis Cathedral. Scoping out the Mass times, we are planning to come back on Sunday morning. We actually ended up connecting with the Larkins. The whole group visited the Presbytere Museum. The Presbytere houses an elaborate collection of Mardi Gras artifacts and memorabilia. It also included a special exhibit about Katrina. The first person videos of hurricane Kartina were awe inspiring. I particularly enjoyed the exhibit that allowed you the viewpoint of riding on a float in the Mardi Gras parade. From there, we did a walking tour of the French Quarter. We wandered up Royal Street. We kept losing Janie and Sharon as they shopped. We made a stop to regroup at Lafitte's Blacksmith Shop. 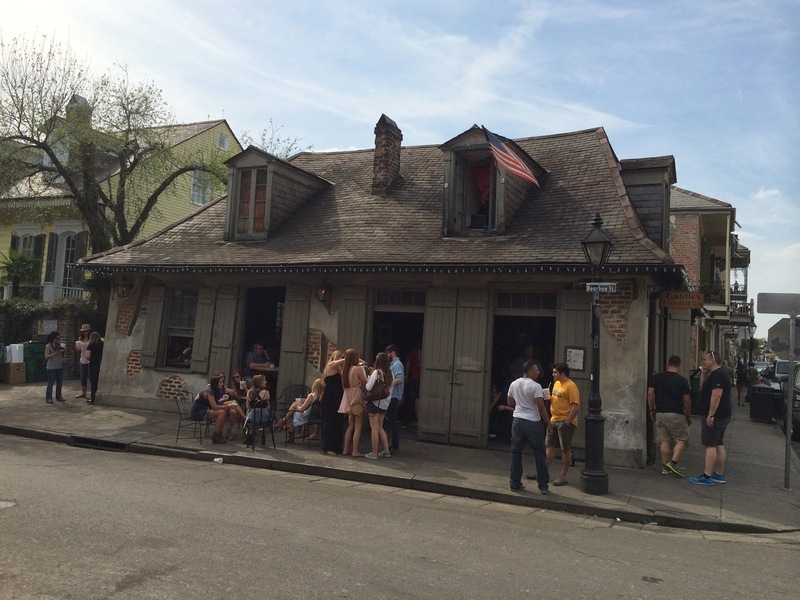 Built between 1722 and 1732 by Nicolas Touze, it is reputed to be the oldest structure used as a bar in the United States. Heading back down Bourbon Street, we found our way to Pat O'Briens. Kevin and I were able to jump on a table in the courtyard. It was about this point that we realized that it was spring break for lots of the college kids! This became even more apparent on Friday and Saturday night along Bourbon Street. It was an interesting people watching experience. We continued on the walking tour to Napoleon House. We had a light early dinner. I had jambalaya. Afterwards, we headed back to the hotel to met up with Mary. She flew in on Friday evening. At some point, the Gainsleys texted us and we headed back to the Bourbon Bar [same procedure as last night!]. We got the same table and watched the people go by.